If you've spent time in Chicago, you've likely seen the gigantic Morton Salt warehouse nestled into the industrial north branch of the Chicago River. It's hard to miss its corrugated roof, which is painted with the company's dancing-in-the-rain child and its slogan: When it rains, it pours. Today, it was the salt that poured. This afternoon around 2PM, seemingly without warning, the red brick facade of its huge storage facility crumbled under the outward pressure of a roughly 60-foot-tall mountain of loose salt inside. No one was hurt, if you don't count the new cars buried under an avalanche of salt in the lot of an Acura dealership next door, and by the time I booked it down to check it out only the news crews were left at the scene. 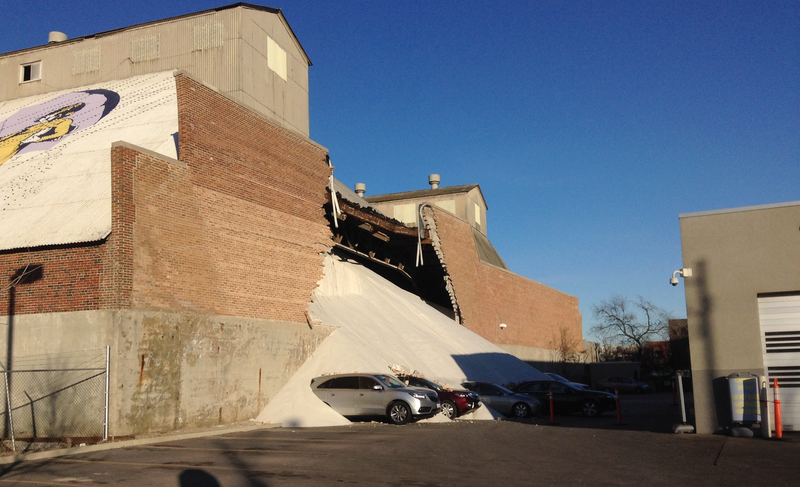 A side wall of our storage facility on Elston Avenue in Chicago collapsed this afternoon, spilling road salt outside of the facility and onto a neighboring property. We are working with local authorities to review and respond to the situation. There are no reported injuries. We will provide additional details as appropriate. Even if you live in Chicago, you might not have realized that salt was still stored and processed here. Though located in a traditionally industrial neighborhood, today the building sits near a Whole Foods, an Old Navy, and a nice protected bike lane. It's a vestige of a different time—just one of dozens of different salt storage facilities operated by Morton, which was founded in Chicago in 1848. But it's also an important one: Though Chicago doesn't sit below salt mines, it's surrounded by Rust Belt cities that do, like Cleveland and Detroit. Since it's located on the banks of one of the city's historic industrial arteries, it's easy to unload salt from other sources and distribute it across the Great Lakes region. According to a great 2012 WBEZ story on the building, even today the warehouse is responsible for processing, storing, and then packaging thousands of tons of salt into a variety of different products, including sidewalk salt. It's been a historically snow-free December here in Chicago—which makes for great speculation about today's collapse, even if it's probably not the cause. But considering the fact that no one was hurt, it's tempting to call it a good omen for a mild winter.